The following article appears in today’s Mansfield (OH) News Journal. To read the entire article and sidebar, click here. MANSFIELD — Members and visitors to Cornerstone Grace Brethren Church will soon have more room for fellowship. 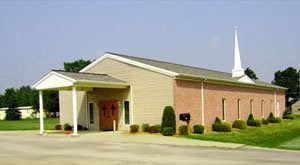 The church at 1905 Lexington-Springmill Road started an addition to its existing church in August 2007, building a fellowship room, a bigger kitchen, restrooms and storage space. The original church was 40 feet by 80 feet and “very basic,” Vnasdale said. The addition is 40 feet by 100 feet — more than doubling the space of the original church. Two larger, handicapped restrooms were installed in the fellowship room, along with a kitchen and huge food pantry. Two Sunday school rooms were installed, and a room for children and young adults was filled with ping-pong, foosball and air hockey tables. The new room also will be used for the church’s quarterly three-fold communion, including washing of feet, a love feast and the bread and cup. In the final stages of preparation, the new fellowship room will be completed by the church’s dedication and open house from 3 to 5 p.m. May 4. The keynote speaker will be the Rev. Gene Witzky, founding pastor of the church. Cornerstone Grace Brethren Church began meeting at Mansfield Christian School in 1989. Witzky retired in 1999. The existing church was built and the congregation moved in August 1994 debt-free, Vnasdale said. On June 24, 2007, the Agape and Cornerstone Grace Brethren churches voted to merge congregations. Vnasdale said before Easter, the congregation was at 65 people. “On Easter we had 143 people,” he said. “It seems the visitors are coming back.